This is a little something I made this weekend because of an abundance of avocados as well as tomatoes. I didn't have pita bread so we ate it with brie cheese and crackers at a friend's house while watching the debate. It's nice having good food while listening to McCain and Obama it helps control my rage. I'm going to have to whip up something amazing this weekend so that I don't go totally mad listening to the vice president candidate debate. Until then I'll eat my left over tabbouleh. chop the tomatoes and avocados into small pieces. using a food processor chop the cilantro, mint, and onion together. Add to the bulgar wheat mixture. chop the leeks and add to the bowl. Mix everything well. Add the tomatoes and avocados to the bowl. Mix carefully so as not to bruise the tomatoes and avocados. Keep in the refrigerator until serving time. Yum! 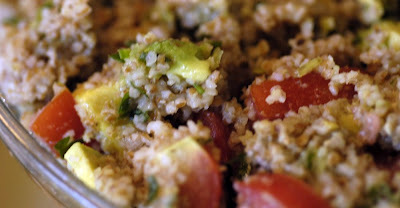 We love eating Tabbouleh, but I've never tried to make it. I will have to try your recipe. It's easy Liz. I hope you enjoy it. Oh yummy, I love anything w/avocados!